Fathers Day 7" chocolate pizzas... a perfect alternative Fathers Day gift. Presented in a pizza delivery box, surrounded in tissue paper, it's such a fun gift and totally yummy! There is even enough to share around with friends and family! 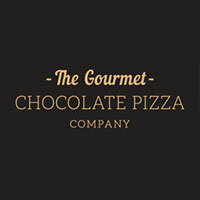 Pizza Toppings: Lilac and pale blue rainbow drops, milk chocolate honeycomb balls, milk chocolate curls and a milk chocolate Father's Day plaque. Available as a 7” pizza only.